I don’t make it out for breakfast very often, as I’m hungry in the morning and usually too impatient to leave the house, go to a restaurant, place my order, and then wait for the food to be served. And when I do commit to going out for breakfast it’s usually somewhere close to home. So my list of top breakfast spots is unabashedly biased toward my own neighborhood: I’ve included picks in Melville, Milpark, Parkview, Parkwood, and Parkhurst. The list is by no means comprehensive, but hopefully helpful for those who frequent Joburg’s inner suburbs. I can’t believe I’ve never written about Salvation Café before. It was one of the first Joburg restaurants I ever ate in — I had lunch there on my maiden visit to Joburg in 2008 — and I’ve been at least 25 times since. Salvation Café is in the courtyard of Milpark’s renovated 44 Stanley complex, with great indoor and outdoor seating, and many locals argue that it has the number one breakfast menu in town. My only complaint about Salvation Café — which is actually a problem for all of the restaurants listed here — is its opening hours: Tuesday-Sunday until 4:00 p.m. (kitchen closes at 3:00) and breakfast served only until 11:30 on most days. For some reason breakfast ends at 11:00 on Sunday, which I find maddening because I always seem to arrive at 11:02. But I digress. Salvation Café’s food is fantastic. I went for breakfast last Sunday (with my blogger friend Vincent, who also wrote about Salvation Café recently) and ordered the breakfast duo — a combination of French toast and eggs Florentine. It was the best breakfast I’ve eaten in months. The Salvation Café breakfast duo. You can also have it with eggs Benedict. 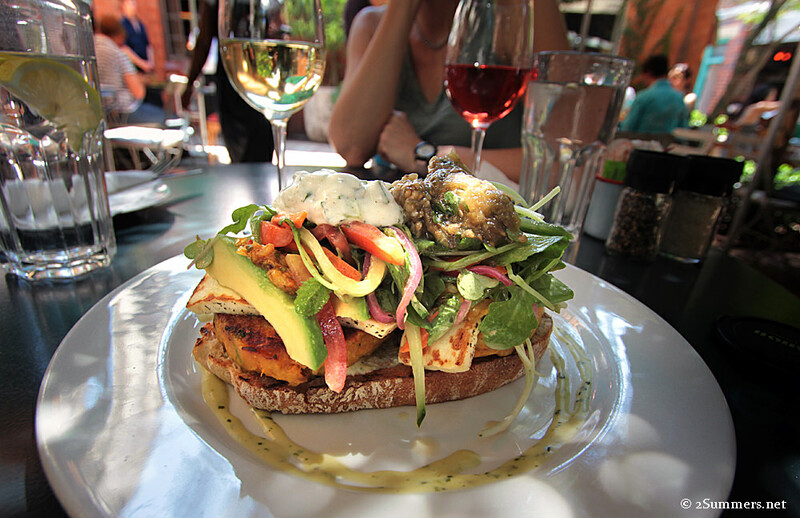 I’ve been looking for an excuse to post this photo of a haloumi-chickpea sandwich, from the Salvation Café lunch specials menu in March 2012, for years. So I’m doing it now even though it’s off-topic. The Service Station is a Melville institution and my go-to breakfast spot, less than two blocks from my house. I love the Service Station for its corner location in the Bamboo Shopping Centre, its big glass windows, and its sunny, locals-only vibe. The Service Station has expanded recently, alleviating the crowds that used to plague it on weekend mornings. I usually order a veggie omelette — stuffed with fresh produce — in an effort to be healthy, although the French toast and the flapjacks with banana and bacon are spectacular. The Service Station is also known for its coffee although I find it just okay. 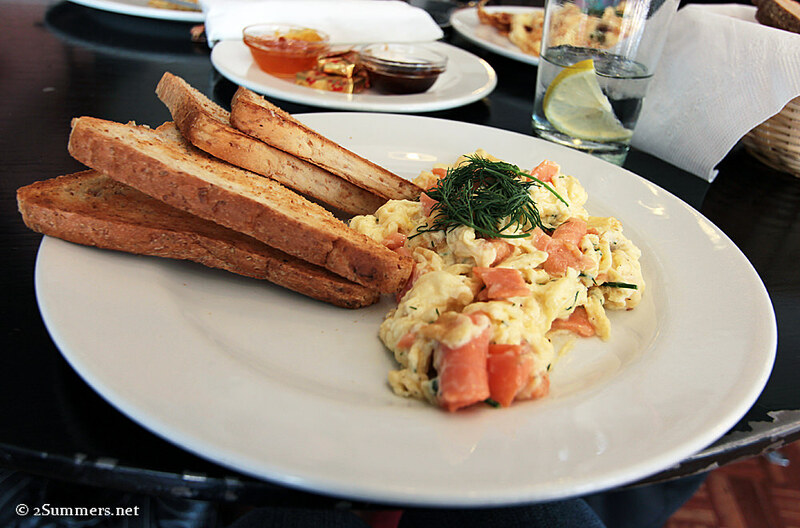 Scrambled eggs with salmon, another Service Station favorite. I usually find Parkhurst too trendy; its restaurants are always packed to the rafters with impossibly well-dressed people. Nice on 4th is an exception though — it’s toward the end of the 4th Avenue strip and has a quaint, quirky vibe that I like. Nice’s signature breakfast dish is its egg basket: a basket made of toast and filled with poached eggs, bacon, and other yummy things. I can’t find my photo of the Nice egg basket but trust me, it’s adorable and delicious. Nice also has an independent book store next to the restaurant where you can sit and order food. I wish I knew what happened to the photo I took of Nice’s breakfast. 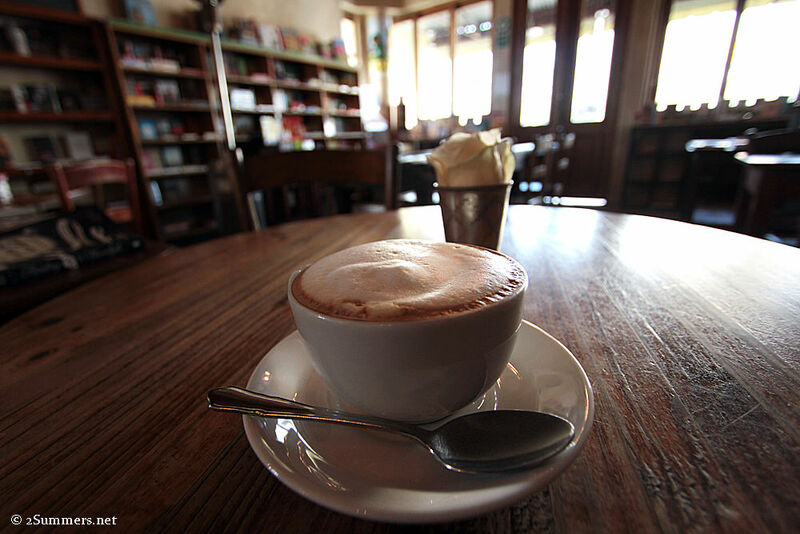 Anyway here’s a shot of a cappuccino in the bookstore. Croft & Co used to be an upscale clothing shop and the website still indicates this. But don’t be fooled; Croft & Co is one of the best restaurant/coffee shops in Joburg. I don’t know what the Croft & Co chefs do to their scrambled eggs but I hope they never stop doing it. Croft & Co also serves delicious fruit juice — the “green juice” is my favorite. Croft & Co has a really nice atmosphere (a bit Parkhurst-like but not too bad) and fast, free wifi, although I’ve heard they just changed to one of those hourly internet voucher systems. (Boo.) The eggs will keep me coming back though. 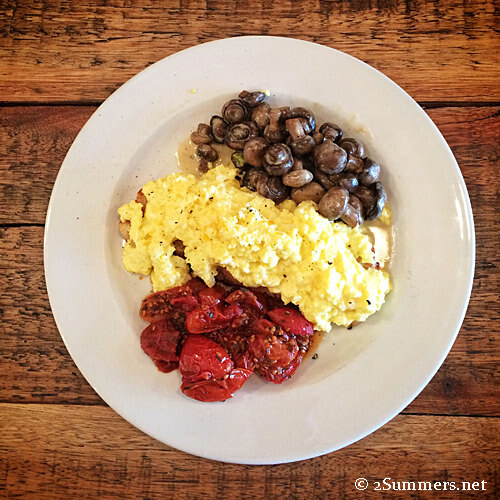 Croft and Co’s signature scrambled eggs, mushrooms, and tomatoes — simple but scrumptious. The Park Café is hidden on the lower level of the Parks Shopping Centre, a tiny complex on Jan Smuts Avenue. You have to make a conscious effort to find this place, which is why it took me so long to go. But Park Café is such a nice little secret. Despite being in the bottom of a shopping centre, it’s bright and cheerful — busy but not too busy. Park Café has the best coffee of all the places I’ve profiled here, and a unique breakfast and lunch menu. There’s also a small spa next door (a pair of sisters own the café and the spa) that does great manicures and pedicures. 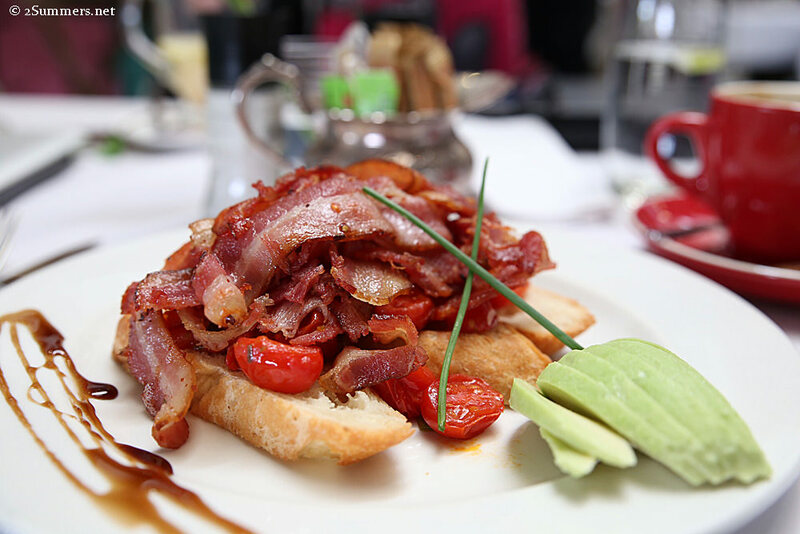 Park Café’s “Bacon and spicy tomato express”. 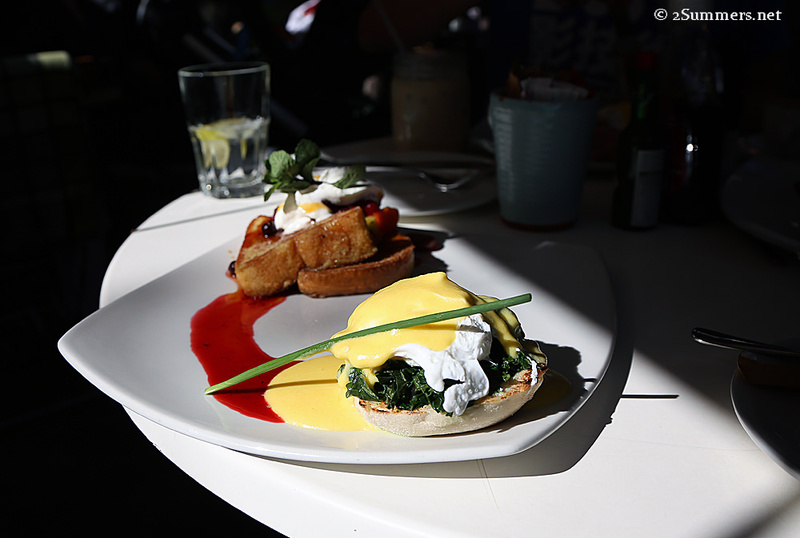 There you have it: the best breakfasts in my corner of Joburg. If you have a favorite (or favorites) that you’d like to share in your own Jozi neighbourhood, feel free to comment. Hey!! Glad to see that the Breakfast Duo is now getting the attention it deserves!! I will check out some of these places, there are a couple I’ve never visited! Haha, awesome. Happy to provide you with some new ideas. have been to all of these except Craft&Co. i’ll sneak out of work during lunch and give it a try. 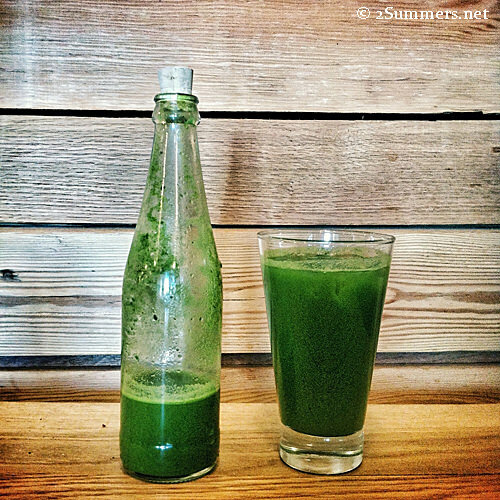 That green juice sold it for me. Ah, you’ll love Croft & Co. Great brunch spot but be sure to get there early. Great list! You should try the Olive and Plates restaurant on Wits campus one day, stupendous breakfast. Frustratingly, not open on Sundays….. Yes, I love that place! I actually blogged about it in my top five ‘Cheap Eats’ post. I’ve never been there for breakfast though – thanks for the tip. It is terribly frustrating that it’s not open on weekends.